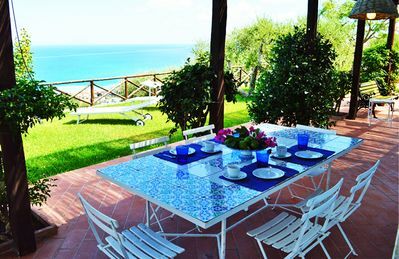 VILLA ORTENSIA is a charming villa for up to 12 people, spread out on three floors and just a short walk from the beach. From Villa Ortensia, you will enjoy an amazing view of the sea, the Gulf of Naples and the island of Capri. 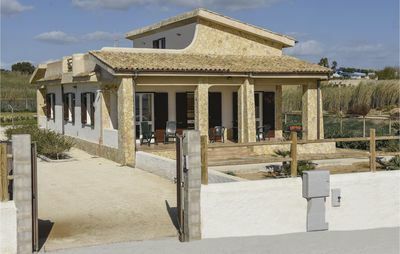 The villa is around 250 square meters in size, with a private swimming pool, direct access to the sea, a panoramic private terrace with sea view, air conditioning, parking and Wi-Fi. 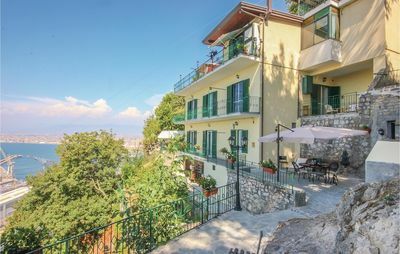 Located in a quiet private residential district close to the beach at Massa Lubrense and a short car ride from Sorrento, this beautiful villa offers a splendid sea view and an equally beautiful interior. 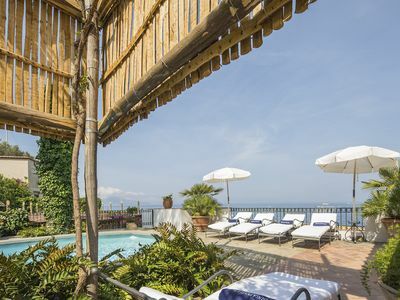 The villa is ideal for a family vacation, as a base for exploring the famous Amalfi coast with friends, or as the backdrop for a romantic honeymoon. The comfortable furnishings and breathtaking views guarantee total relaxation. Even if you will be tempted to stay at this refuge by the sea, it’s also worth making the short walk to the private beach club and following the path from there to the bars and restaurants of Massa Lubrense. Spend the afternoon in Sorrento or Marina del Cantone, about 4 and 6 km away respectively. A trip to Positano (27 km), or Amalfi (36 km) will take you through truly memorable scenery. 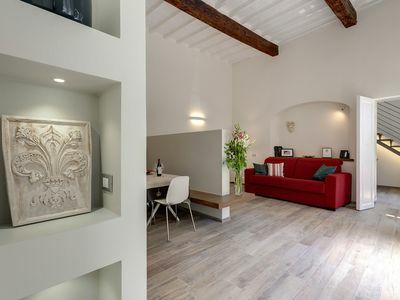 If you have time, take a day trip to Naples (55 km), or spend time walking the city streets on your way to or from Naples International Airport, which is 60 km away from the villa. 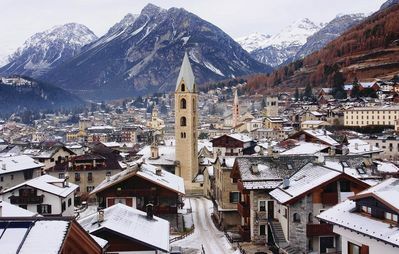 You will be about 1 km from the centre of Massa Lubrense, where you will find shops and restaurants. There is a Sitabus bus stop 550 m from the villa, and the closest beach (Marina della Lobra) is just 20 m away. 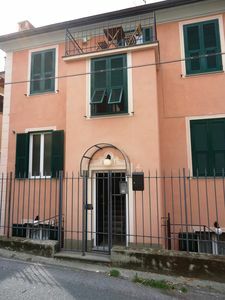 Access to Villa Ortensia is up 15 steps from the parking area. 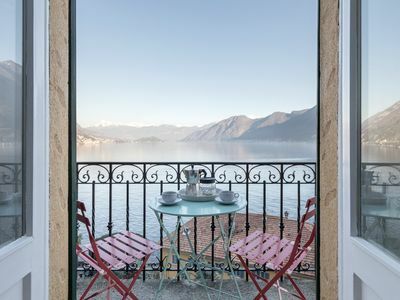 For a comfortable stay at Villa Ortensia, we recommend you have a car available. You will be able to park in the villa’s private parking area, which is large enough for four vehicles. 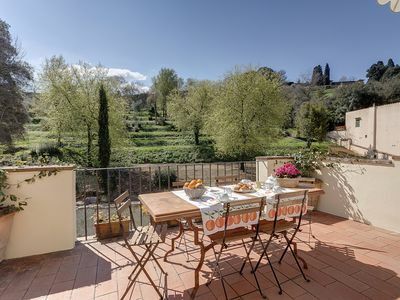 The villa is surrounded by a beautiful garden and large terraces of around 1200 square meters in size. They’re equipped with chairs, sun loungers, tables, parasols and a charcoal barbecue. 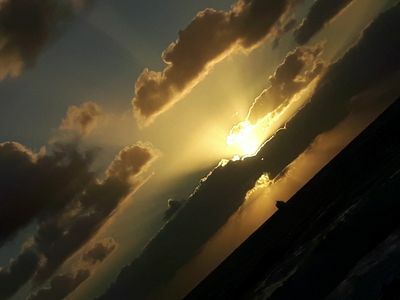 From here, you can enjoy a spectacular view of the sea. 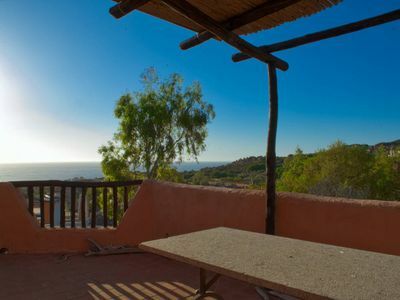 From the property, you will have direct access to the beach, where you will find parasols, sunbeds and a private bathroom with shower and hot water. You reach the beach from the villa by descending 60 steps. THE PRIVATE SWIMMING POOL is 8 meters long by 3.50 meters large in size and 90 cm deep. The pool area is equipped with chairs and sunbeds. From here, you can also enjoy a stunning view of the sea. THE LIVING ROOM is large, bright and tastefully furnished. Here you will find a television, sofas, tables and a beautiful fireplace. The room is fitted with air conditioning, heating and Wi-Fi. 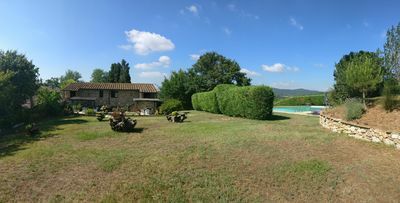 From here, there is access to the terrace and garden with sea view. 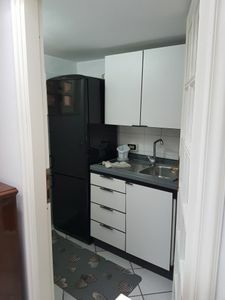 THE KITCHEN is fitted with five gas hobs, an electric oven, toaster, fridge-freezer, coffee machine, dishwasher, washing machine, kettle and other appliances. Here you will also find a breakfast table for six people. The kitchen is accessed from the living room. THE FIRST BEDROOM, WITH EN-SUITE BATHROOM, has a double bed, air conditioning and heating, and is accessed from the corridor. The bathroom is fitted with a sink, toilet and bath tub. THE SECOND BEDROOM, WITH EN-SUITE BATHROOM, contains a single bed and is accessed from the corridor. The bathroom is fitted with a sink, toilet and bath tub. THE THIRD BEDROOM, WITH EN-SUITE BATHROOM, has a double bed, air conditioning and heating, and is reached from a corridor. The bathroom is fitted with a sink, toilet, bidet, hairdryer and shower. From the bedroom, you have access through the terrace windows to a terrace with sea view. THE FOURTH BEDROOM, WITH EN-SUITE BATHROOM, has a double bed, air conditioning and heating, and is accessed from the corridor. The bathroom is fitted with a sink, toilet, bidet, hairdryer and bath tub with shower fitting. From the bedroom, you will have access via the windows to the terrace with sea view. It is possible to add on single bed in a small tower next the room. 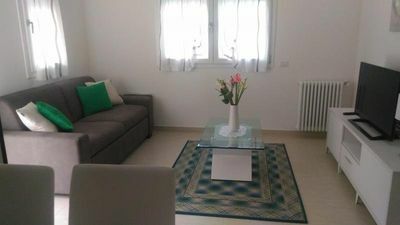 THE SECOND LIVING ROOM is furnished with sofas and tables and fitted with air conditioning and heating. From the living room, you have access to a patio with tables and chairs. THE SECOND KITCHEN is fitted with two gas hobs, an electric oven and a fridge. THE SEVENTH BEDROOM, WITH EN-SUITE BATHROOM, has a double bed (which can be converted into two single beds), air conditioning and heating. The bathroom is fitted with a sink, toilet and bath tub. You reach the bedroom from the second living room. 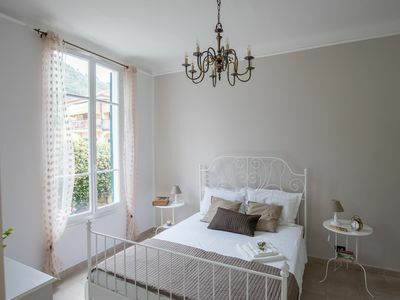 THE EIGHT BEDROOM has a double bed, air conditioning, heating and a beautiful view of the sea. You reach the bedroom from the second living room. THE SIXTH BATHROOM is fitted with a sink, toilet and shower, and is accessed via the corridor. 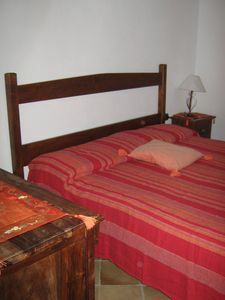 -	Tourist tax 2,00 Euros per day per person for the first 5 nights from April to October 31. The children under 18 years do not pay. -	For arrivals after 8:00 PM will be applied an extra cost of 60,00 Euros to be paid at the arrival. -	damage deposit: 700,00 Euros in cash. The Damage deposit will be returned prior to your departure unless there are accidental damages to the property. -	Heating not included. If requested will be charged 50,00 Euros per day of use to be paid on site in cash. -	Air conditioning not included. If requested will be charged on consumption to be paid on site at the checkout in cash. 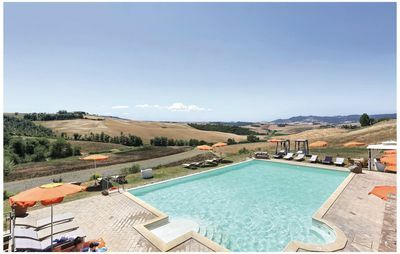 -	Extra linen and towels change: 13 Euros per person. -	Daily cleaning not included 350,00 Euros per week to be paid on site in cash. Daily cleaning is scheduled for 5 hours a day, 6 days per week. -	Final cleaning: 250,00 Euros to be paid on site in cash. -	The beach is a rocky beach. 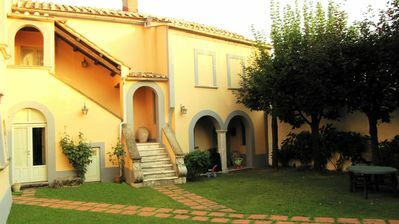 -	The street that the villa is on is very narrow and is therefore not recommended for very large vehicles. 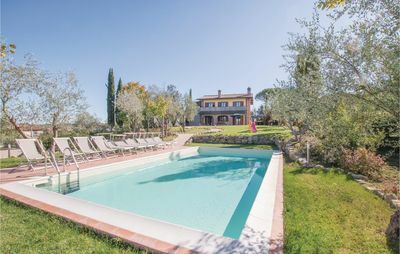 -	For larger groups, the villa can be booked along with Villa Acquamarina, which is next door, for a combined total of 18 guests. 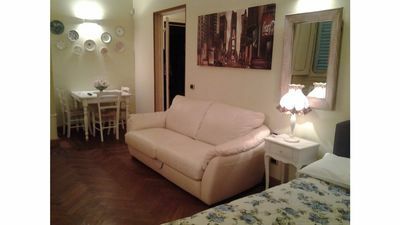 Historical Center of Florence "Viola Apartment"